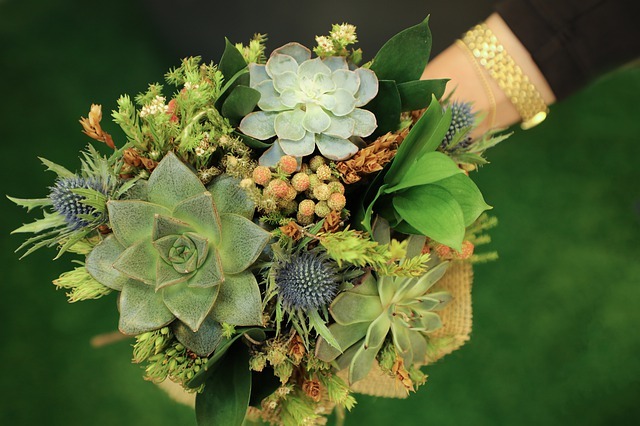 Not only are succulents a budget-friendly choice they are also water-wise and thus very suitable and convenient for wedding decor and the bride's bouquet because they can be created days before the event. Corsages created with succulents are long-lasting. My love for succulents goes back for many years due to our local Mediterranean climate. 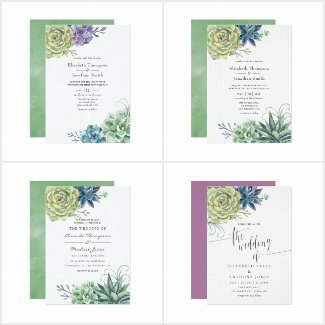 The succulents on these card designs are photos taken from my own succulent collections. 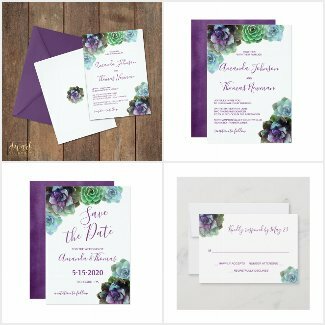 For succulent lovers having this design on their invitations for their event will reflect a personal touch to family and friends. Succulents are easy to maintain, will not wilt during the ceremony or reception. They are great for both formal and informal weddings and can be given to guests as gifts after the event. Pale blues with a soft outdoor green and sunny creams - when nature wakes up from its winter slumber and comes back to life. 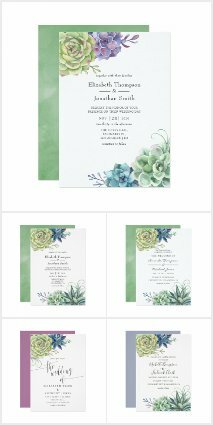 Beach Yellow, Cool Mint, Pale Gray, & Ivory - Fresh mint green paired with warm beach texture, welcoming blue-green leaves feels like a cheerful springtime color. Endless opportunities with blue-green Echeveria's. They look spectacular due to their low growing rosettes with bell-shaped flowers on a pink stem edged with light pink. 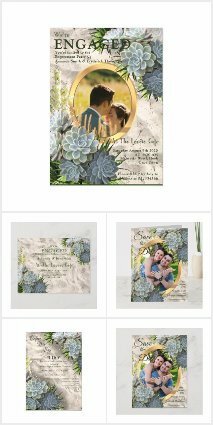 I have collected many succulent decor ideas on my Pinterest board and gifts with the same stationary succulent design may be ordered. 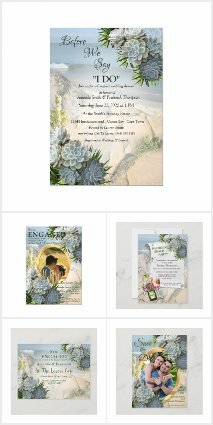 If the wedding takes place near a Beach, near an ocean or in a tropical garden, all three options are reflected by the invitations. If the couple knows their style, the right kind of choices for the appearance makes the wedding day a perfect one ~ with ease and no worries. Here are some more idea designs with Succulents. 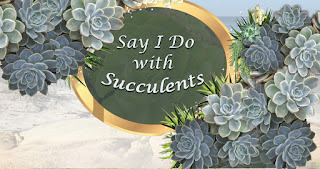 Succulent Wedding at the Seaside. Bridal shower games are a great way to break the ice. They are guaranteed to get your guests interacting with each other and are a surefire way to avoid a flop! I am hoping to add a lot more bridal shower games to my wedding stationery sets in the coming months so as to be the "go to" for said games. So take a look at these unique and fun bridal shower games to make your occasion an entertaining and memorable one. 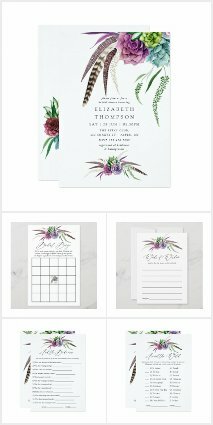 To compliment my wedding collections, I wanted to bring something new to the table for my invitation store on zazzle. I have compiled a variety of bridal shower games to match the bride's mood. In this scenario I chose succulents because they are very popular. This particular design has a unique departure from the ordinary as it has boho feathers in the mix to bring a mystical aura to it. Bridal bingo, and the bride wore, around the world, honey-do's, animals mate's names, what's in your purse? 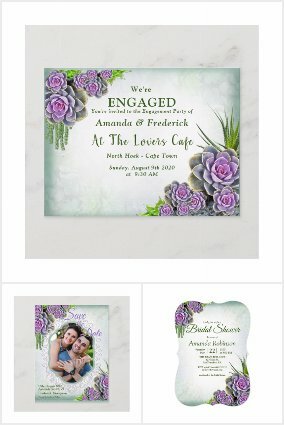 and many more games come together to compliment this collection with matching bridal shower invitation and display shower and gift registry cards.